The purpose of the scheme is, having regard to available resources, to support the transport to and from school of children who reside remote i.e. 4.8 kilometres (kms) or more from their nearest education centre. Under the terms of the Department's Post-Primary School Transport Scheme children may be eligible for transport where they reside 4.8 kilometres or more from their nearest education centre, subject to limited exceptions relating to ethos and language. While it is the prerogative of parents to send their children to the post-primary school of their choice, eligibility for school transport at post primary level is to the nearest education centre/school, subject to limited exceptions. Children who, for reasons of their religious ethos, choose to attend their nearest minority religion denominational school may be eligible for school transport to that school, even if it is not their nearest school. Children who choose to attend their nearest all-Irish school/unit may be eligible for school transport to that school/unit, even if it is not their nearest school. Children who choose to attend their nearest all-English school/unit may be eligible for school transport to that school/unit, even if it is not their nearest school. 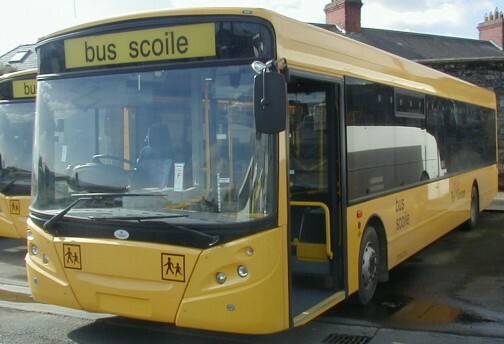 The parents/guardians of a child wishing to avail of school transport services, for the first time, are required to submit a completed Application Form for Post Primary School Transport to their local Bus Éireann office; details of local Bus Éireann offices are available on the Department and Bus Éireann websites. Where practicable, and subject to considerations of cost and logistics, routes are planned to avoid an eligible child having to travel more than 3.2 kms to or from a pick up/set down point or to have travel and waiting times in excess of 2.5 hours per day. Routes are planned on the basis of the locations of children who are eligible for school transport only. An eligible child for whom no transport service is available may, following an application for transport within prescribed time limits, receive a Remote Area Grant (RAG) towards the cost of private transport arrangements. The RAG is also payable for eligible children who may have to travel 3.2 kms or more to or from a designated pick up/set down point. The availability of concessionary transport may vary from year to year, is not available on public scheduled services and cannot be guaranteed for the duration of a child’s post primary school education cycle. Where the number of applications for transport on a concessionary basis exceeds the number of seats available, Bus Éireann will determine the allocation of the tickets.